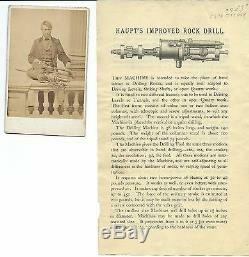 Ultra Rare Combination of a CDV of Hermann Haupt, Civil Engineer, Inventor, Civil War General and one of his creations a workable Drill for Drilling Rock and a Brochure by Blanchard & McKean of Paris France Advertising the Drill. A view of the drill is printed on the Brochure and the actual drill is photographed in the picture. Haupt born in Philadelphia went to West Point to study, resigning is his commission to work on Railroads in Pennsylvania including Gettysburg where he met his wife Ann C Keller. Taught Mathematics at Pennsylvania College the precursor of U Penn, served as Chief Engineer of several railroads and tunnels of importance. During the Civil War he created the dept for coordinating the Railroads as a Volunteer Colonel, was promoted to Brigadier General in 1862. His assistance in keeping trains of supplies and equipment to McClellans army at Antietam and Meade's army at Gettsyburg was deemed critical to their success's in those battles. He jumped on one of the trains with the wounded to Washington and was the first man to arrive in the Capitol with news of the defeat of Lee's army at Gettysburg on July 3rd! The drill he created and shown here was given the top prize at the Royal Polytecnic Society in England! Overall one of the most important Railroad men of the 19th Century and major contributor to the success of Union Armies in the field during the Civil War. 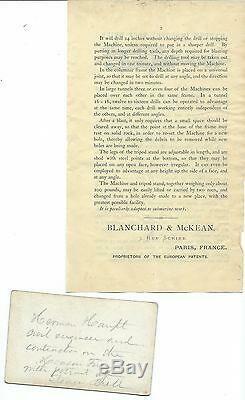 "Guaranteed period item from the Civil War" "Guaranteed Civil War image from the 1860's". The item "Carte De Visite Civil War General Hermann Haupt and Invented Drill Brochure" is in sale since Thursday, May 11, 2017. This item is in the category "Collectibles\Militaria\Civil War (1861-65)\Original Period Items\Photographs". The seller is "civil_war_photos" and is located in Midland, Michigan. This item can be shipped worldwide.